Whatever your desires, the Mercantour Stations will meet your expectations! Nature lovers and hikers will stroll along the trails in the heart of the preserved site of the Mercantour National Park. Those who are nuts of bicycle will cross the most beautiful mountain passes, on the Italian border, or between Alpes-Maritimes and Alpes of Haute Provence, to reach the top of the Bonette, the highest road in Europe. 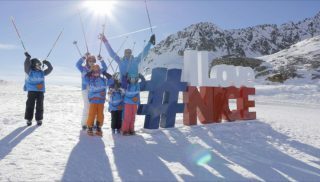 The most intrepid will be able to enjoy the kilometers of tracks dedicated to the descent by mountain bike, on the essential areas of Auron and Isola 2000. As you can figure out the valley of Haute Tinée is rich in distractions, whether for a day trip or for a longer stay. This map shows it to you. Just have a look! The National Park covers 28 regional municipalities, that is to say more than 2,000 km2. This territory is a place of harmony between protection, discovery, local development and respect for traditional activities. Everywhere, nature deserves attention and respect : it is better to admire than to pick, to observe discreetly than to disturb. The Tinée valley stretches for about 80 kilometers from its confluence with the Var (La Mescla) to the sources of La Tinée, at the foot of the Col de la Bonette. 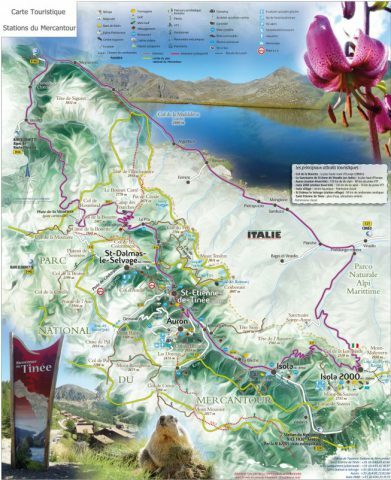 The high valley offers large expanses of alpine lawns up to the Bonette Pass, which has the highest road in Europe at more than 2,800 meters above sea level, as well as high-altitude lakes surrounded by mountain peaks, the highest of the Mercantour. Ibex, chamois and mouflons coexist here. Deer, roe deer and wild boar occur in lower woodlands. Ornithological richness: black grouse, rock ptarmigan, nutcracker, and large raptors such as the golden eagle and bearded vulture are the most remarkable birds that populate the territory. A few packs of wolves, back since 1992, have settled on the Haute Tinée. 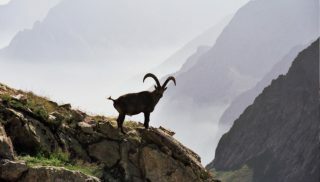 Thanks to the action of the National Park, all these symbolic animals, some of which have almost disappeared, are once again populating the Mercantour mountains, where the discreet and attentive walker will be able to observe them. More common: marmot, ermine, bats and many others enrich the diversity of environments with their presence. Thanks to multiple climatic and geological influences, composed of a mosaic of environments at various altitudes, the Mercantour can boast of having a unique flora in Europe, more than 2 000 plant species out of the 4 200 known in France. Of these, 220 are considered to be very rare, 40 of which are said to be endemic, such as the Saxifrage with numerous flowers found nowhere else in the world. The larch tree of light symbolizes the beauty and power of the Mercantour nature. The exceptional character of the Mercantour site justified in 1979 its classification as a National Park, a designation recognized worldwide as the highest level of quality and protection of remarkable natural spaces. 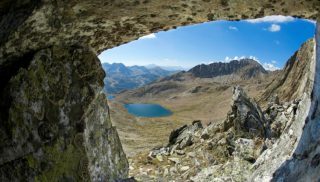 Our Italian neighbors have also created the Parco Naturale Alpi Marittime, around the Argentera massif, whose summit rises to 3,290 m, just across the border. The two parks together form a large, transboundary protected area, which in 1993 obtained the Council of Europe diploma for exemplary management.